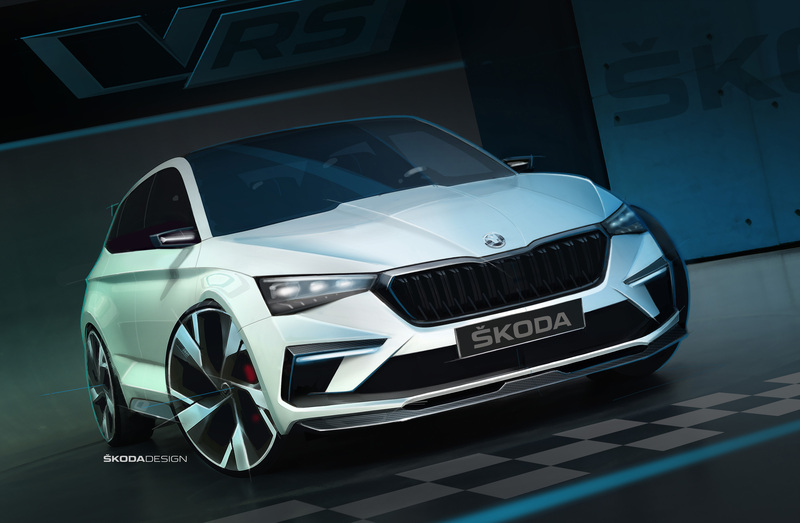 The compact study, the ŠKODA VISION RS, demonstrates how ŠKODA envisages its sporty RS models in future. Entirely in keeping with ŠKODA’s 117-year motorsport history, these RS models will be even more emotive and sporty, but also more sustainable thanks to the use of vegan materials and electrified drive systems. 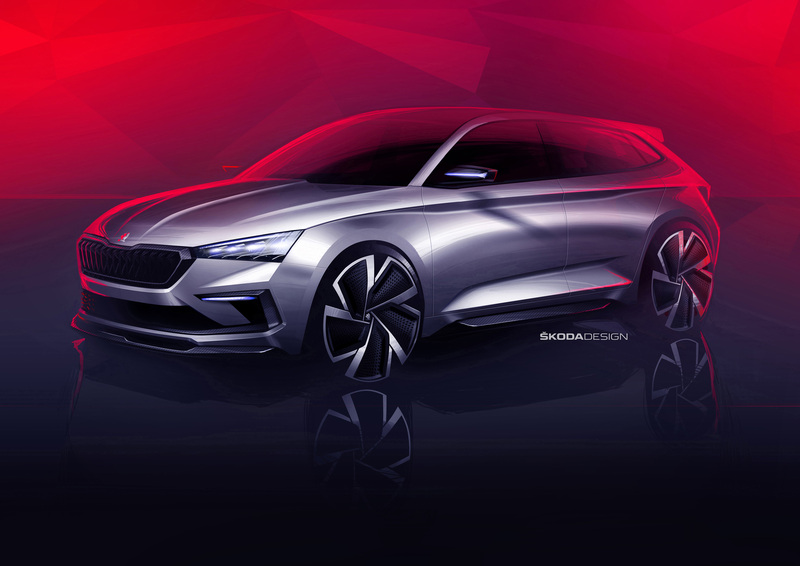 What’s more: the ŠKODA VISION RS also offers a look ahead at a future ŠKODA model in the popular compact car segment. The initials, which were used for the first time for the 180 RS and 200 RS rally cars in 1974, have adorned the sporty versions of various ŠKODA model ranges since 2000. These include the OCTAVIA RS, FABIA RS and the KODIAQ RS, which will be presented at this year’s Paris Motor Show. The ŠKODA VISION RS shows how RS models from the Czech car manufacturer could look in future – in every detail, it blends great sportiness with sustainability and functionality in a compact car. Dynamic lines and highlights made of carbon fibre, a light and strong high-tech material from the world of motorsport, lift the RS DNA to an even sportier level. The electrified drive system gives the ŠKODA VISION RS a high level of driving dynamics combined with efficiency. Its plug-in hybrid drive combines a 1.5-litre petrol engine delivering 110 kW (150 PS) with a 75-kW electric motor and has a total power output of 180 kW (245 PS). CO2 emissions of just 33 g/km highlight the sustainability of the drive system. The ŠKODA VISION RS can travel up to 70 km purely electrically and therefore without producing any emissions. 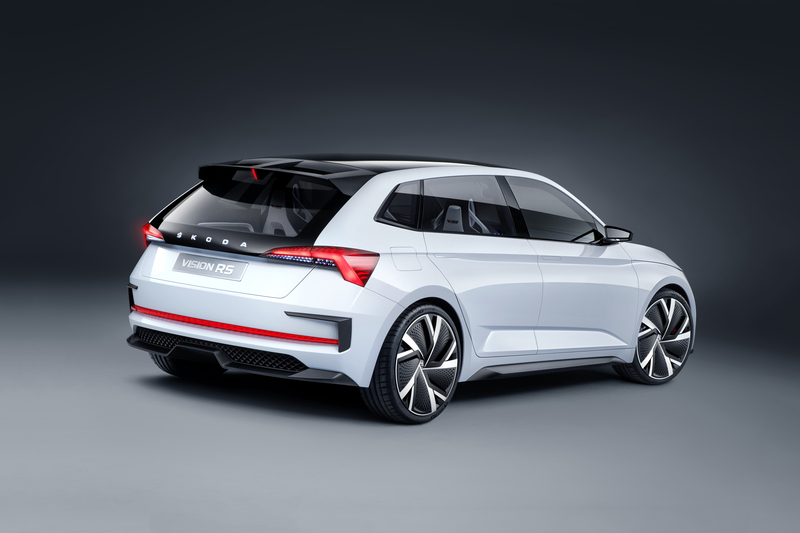 Besides all of the sportiness and emotiveness, the five-door concept study also impresses with functionality and a spacious interior, just like all ŠKODA models. 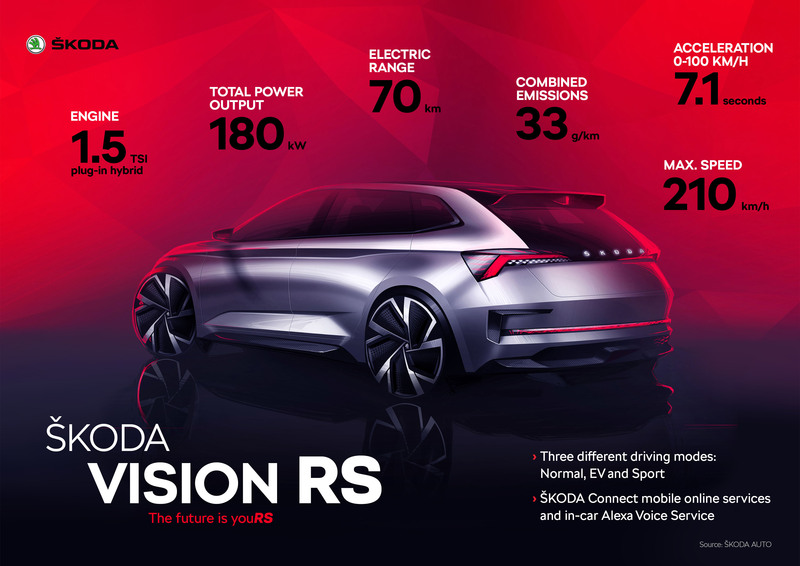 At 4,356 mm long, it offers space for 4 passengers and has a boot capacity of 430 l. Innovative connectivity solutions and the Amazon Alexa ŠKODA Connect Skill also equip the ŠKODA VISION RS for the digital everyday life of the future. 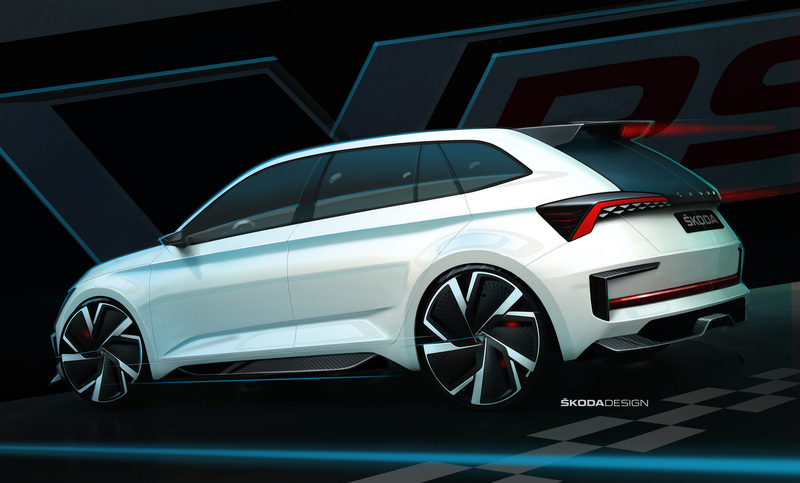 With the VISION RS, ŠKODA is taking another stride into the future by presenting an electrified drivetrain in a car model bearing the RS initials. The concept study’s plug-in hybrid drive with a power output of 180 kW (245 PS) enables a dynamic driving performance. A range of up to 70 km is possible with purely electric drive. The CO2 emissions of just 33 g/km emphasise the car’s outstanding efficiency for an RS model. The drive unit of the ŠKODA VISION RS is a combination of a petrol engine and electric motor. The 1.5‑litre TSI engine produces 110 kW (150 PS); the electric motor complements this with a power output of 75 kW (102 PS). The total power output is 180 kW (245 PS). The plug-in hybrid drive for the ŠKODA VISION RS transfers its power through a six-speed DSG. The design study can accelerate from a standing start to 100 km/h in 7.1 seconds, and its top speed is 210 km/h. The ŠKODA VISION RS completes a short burst from 80 to 120 km/h in 8.9 seconds. In total, the compact sportster emits only 33 g of CO2per km. The energy for the electric motor is supplied by a lithium-ion battery with a total capacity of 13 kWh, of which 9.9 kWh can be used. Using a cable, the battery can be charged in 2.5 hours at a charging station at home or in a household power socket – which is particularly eco-friendly if the electricity is produced from renewable sources. Alternatively, the battery can also be charged while driving using energy recovery. The driver can choose from three driving modes: Normal, EV or Sport. The Normal mode is used for the best combination of petrol drive and electric engine. The EV mode is used for purely electric drive. The Sport mode is used for a speedy ride, on a circuit for example, where maximum power is needed. If the driver chooses purely electric drive (EV mode), they can travel up to 70 km on a fully charged battery without producing any emissions. 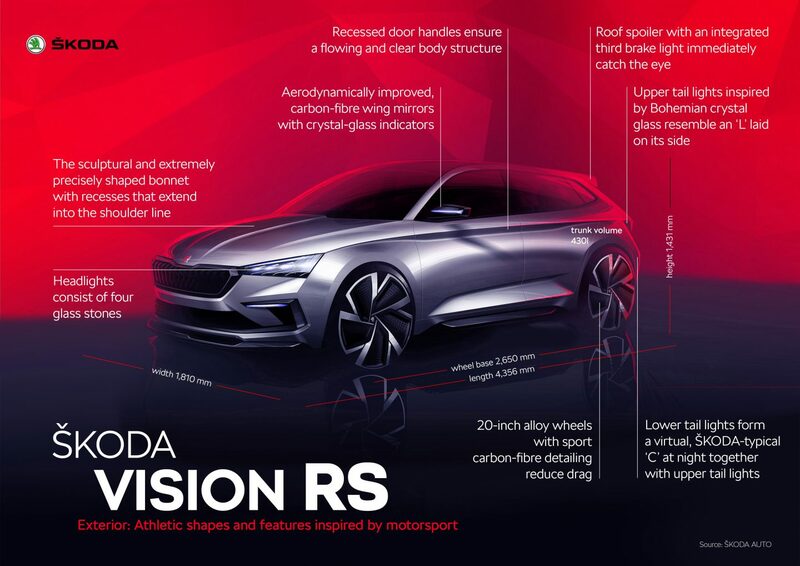 The exterior of the ŠKODA VISION RS combines powerful and sporty elements, carbon-fibre components as well as exceptional aerodynamics with harmonious lines. 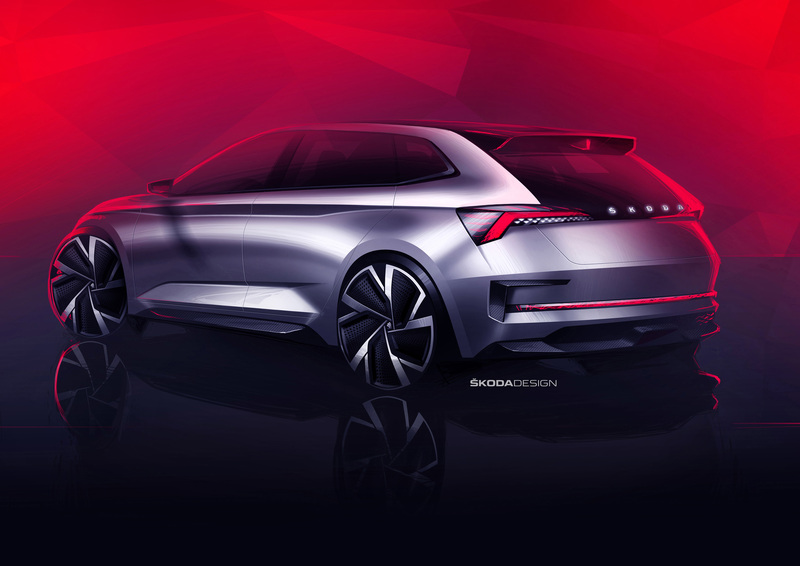 This offers a preview of the design language of ŠKODA’s future sporty models. The dynamic impression continues in the interior with a minimalist and precise design. 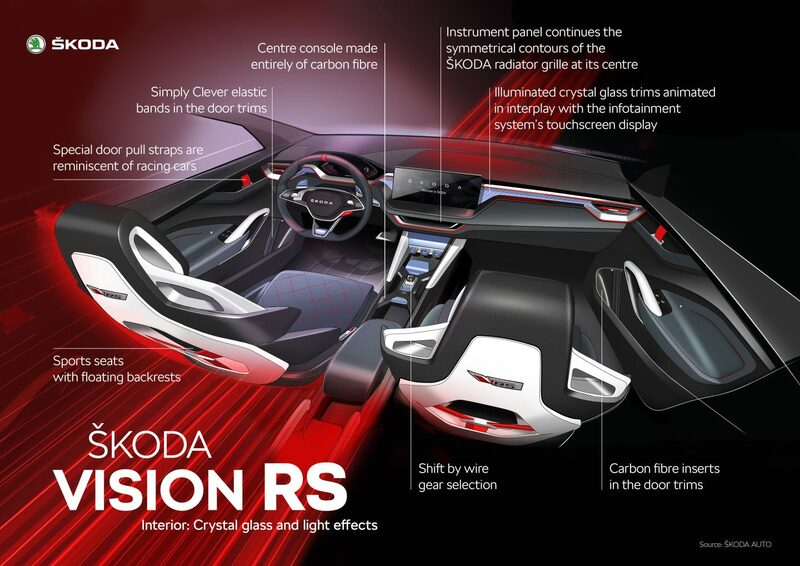 With a large central display, sports seats, bold colourful touches as well as carbon-fibre and crystal-glass details, the design language of the ŠKODA VISION RS has evolved from that of the ŠKODA VISION X in every detail. From every angle, the ŠKODA VISION RS demonstrates its unique character and a completely new form of RS DNA. The sculptural and extremely precisely shaped bonnet sports a ŠKODA logo made of illuminated crystal glass. The high-gloss black carbon-fibre slats of the radiator grille are also illuminated and display a distinctive shape that is new for the RS family. Carbon fibre is also used for the side air outlets, which improve the aerodynamics, as well as for the air inlet grille and front spoiler. The air inlet and spoiler mirror the shape of the radiator grille. In combination with the clean-cut, narrow daytime running lights, the headlights consisting of four glass stones appear as though they are focussing on the street and, together with the fog lights, they give the car a sporty character. Bold wings and the ŠKODA-typical dynamic shoulder line form a distinctive side view. Frameless, tinted side windows make the ŠKODA VISION RS appear lower and more elongated. 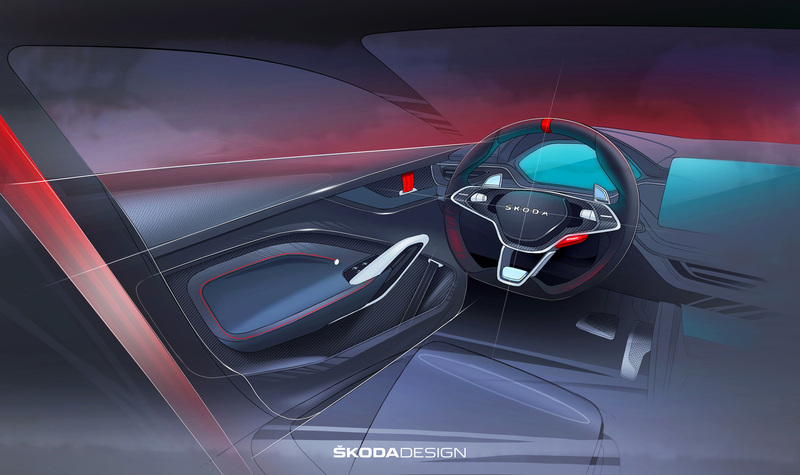 Recessed door handles ensure a flowing and clear body structure, and small Czech flags on the carbon-fibre side sills are a reference to Czechoslovakia’s foundation 100 years ago. The aerodynamically improved, carbon-fibre wing mirrors with crystal-glass indicators are inspired by motorsport. The lightweight, 20-inch alloy wheels, which have been optimised to reduce drag and have a central ŠKODA logo made of glass, also sport carbon-fibre detailing. At the rear, the diffuser – which lacks visible tail pipes for the exhaust system – and the roof spoiler with an integrated third brake light immediately catch the eye. Just like the rear air outlets, both are made of carbon fibre and improve the car’s aerodynamics. The upper tail lights made of bohemian crystal glass resemble an ‘L’ laid on its side and together with the lower tail lights form a ŠKODA-typical ‘C’ at night. The rear of the car also bears illuminated ŠKODA lettering. 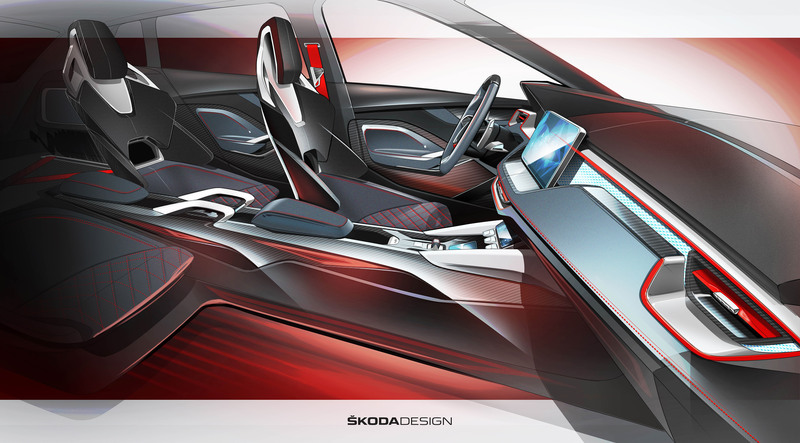 With the VISION RS, ŠKODA is presenting a new interior design that has developed elements from the ŠKODA VISION X concept study shown at the 2018 Geneva Motor Show into a new design language. The generously elongated instrument panel continues the symmetrical contours of the ŠKODA radiator grille at its centre. In addition to a lot of carbon fibre, the interior is dominated by decorative trims made of crystal glass, which are uniquely illuminated and animated in interplay with the infotainment system’s touchscreen display. 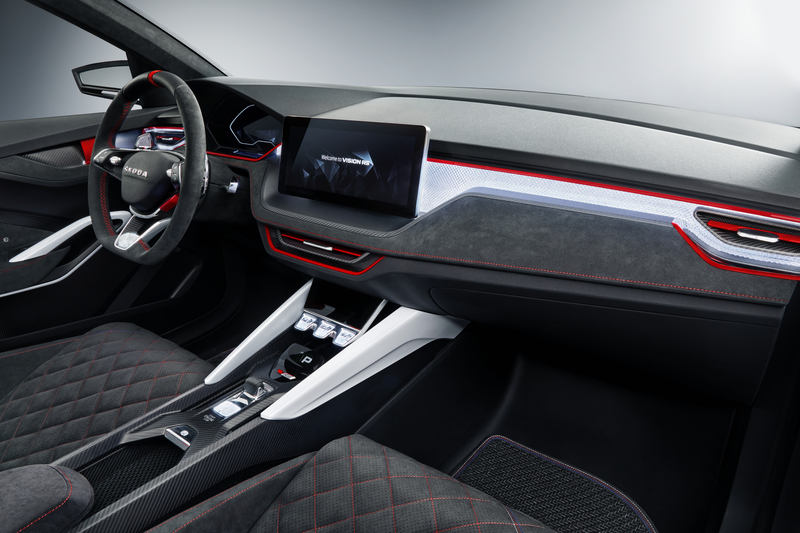 The centre console in a space-frame design, which is made entirely of carbon fibre, as well as additional carbon-fibre elements emphasise just how close the RS models are to the world of motorsport. A minimalistic gearstick is integrated into the centre console and uses shift by wire to operate the DSG. Special door pull straps are reminiscent of racing cars; elastic bands secure the contents of the storage compartments – a typical Simply Clever feature. The door trims partially consist of carbon-fibre inserts. 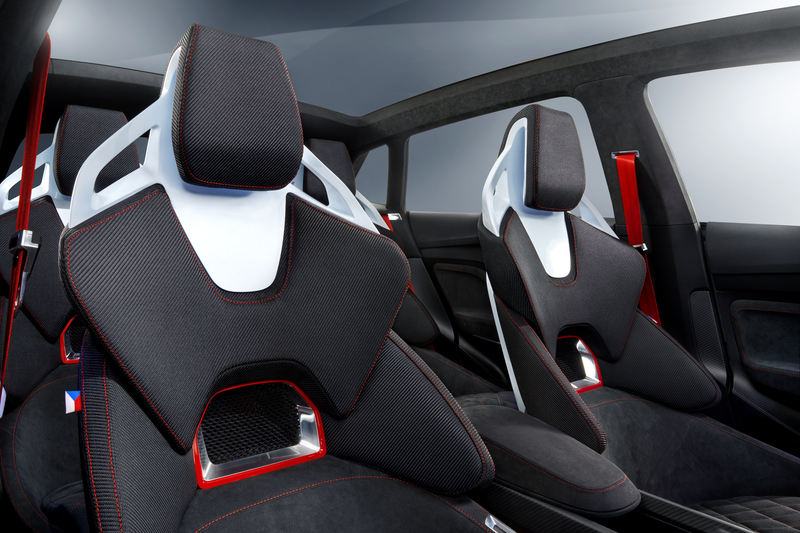 The backrests of the contoured sport seats appear to float. 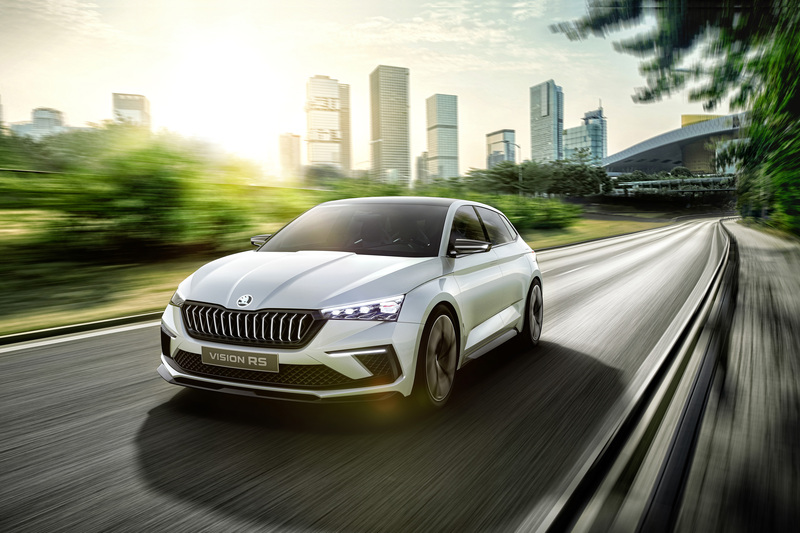 Digitalisation and connectivity are two important pillars of ŠKODA’s 2025 Strategy. 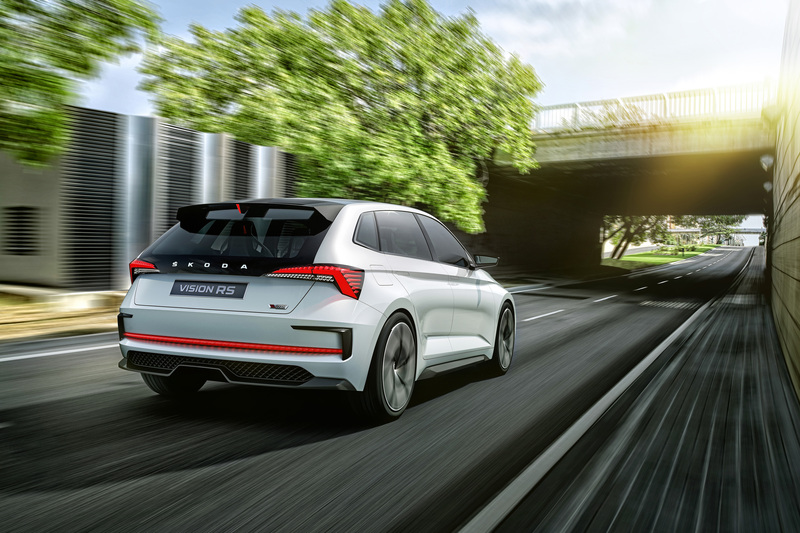 The ŠKODA VISION RS marks the next step towards the digital future, where drivers and vehicles will always be online and will be communicating with each other via the Internet. 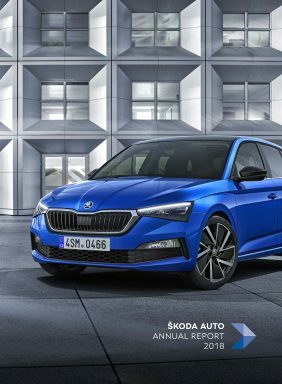 The Amazon Alexa Voice Service is now also incorporated into the world of ŠKODA Connect. The instrument panel’s large central monitor is a prominent element of the interior. It enables the operation of various vehicle functions, such as the choice of three driving modes, as well as the comprehensive range of infotainment and connectivity solutions. 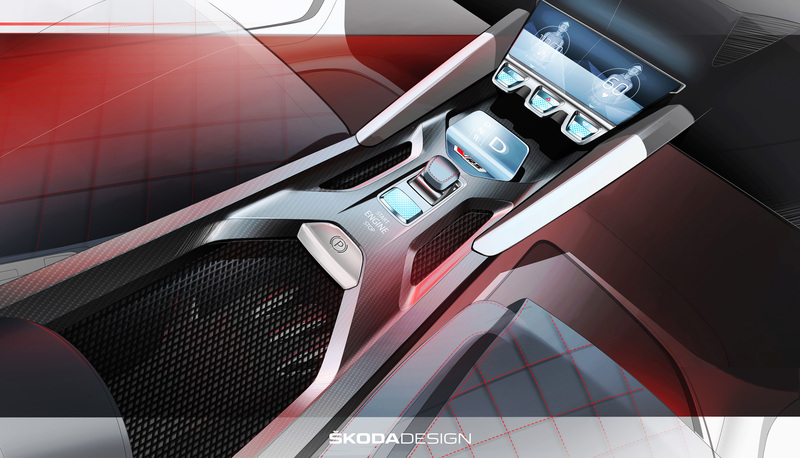 Just like in the ŠKODA VISION X, the high-resolution, colour touchscreen can be moved upwards at the push of a button to reveal a charging and docking station for a smartphone, which establishes a mobile Internet connection. 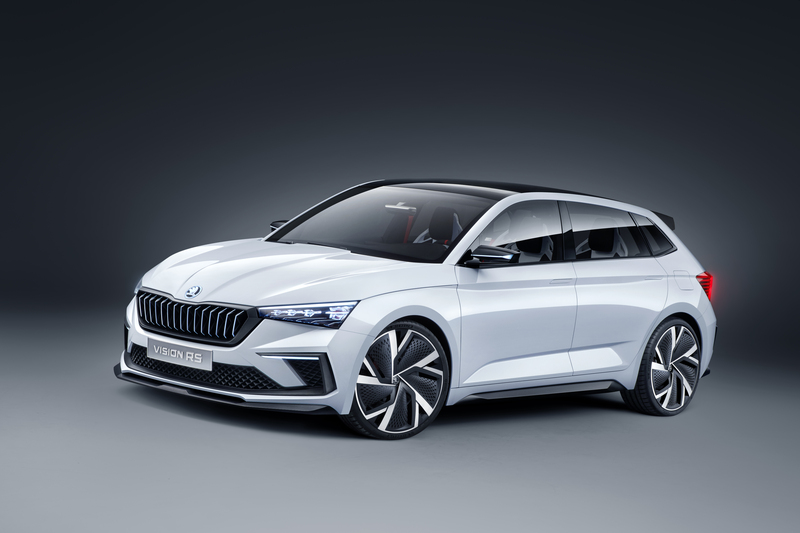 This means the ŠKODA VISION RS is always online and enables access to the ŠKODA Connect mobile online services. These are divided into Infotainment Online, Care Connect and Emergency Call. Infotainment Online includes online traffic information. Care Connect services also include Proactive Service, which establishes connections to customer care or a garage when required. Emergency Call can be made manually; however, it will automatically call for assistance when the airbags or belt tensioners have been activated. 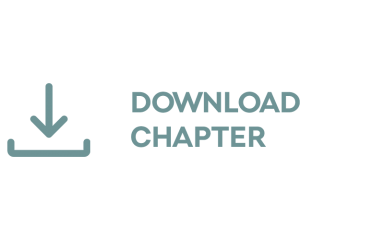 Another step towards the digital future is the integration of the Amazon Alexa Voice Service into ŠKODA Connect. 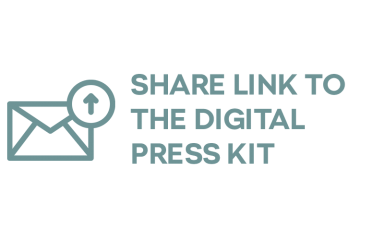 Using an Amazon Echo speaker or the Alexa app for smartphones, a ŠKODA driver can conveniently call up vehicle data at home or whilst travelling, by simply downloading the Alexa ŠKODA Connect Skill and connecting it to their ŠKODA Connect user account. Simply address Alexa and she will answer your question letting you know, for example, how much petrol is left in the tank, whether the car’s windows and doors are closed or when the next service appointment is. Following a successful pilot phase in Germany and the United Kingdom, ŠKODA owners all over the world will soon be able to use the new service in English and German. These will now be followed by a third language – French; Spanish will be offered soon as well.